Planet X's Moon / Comet Hits Earth? I dreamt that I was looking at like a map but it was actually the universe. I saw stars and then I saw Earth, then not too far from Earth I saw another planet that looked just like Earth. 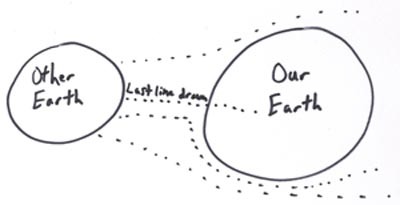 I then saw dotted lines being drawn from one [Earth to the other Earth]. Each line was very close to hitting Earth but didn't. Then the last line drawn went straight into Earth. It looked like the drawing to the right. I now know from studying that this is a red planet, so I couldn't figure out why the Lord showed it to me as another Earth. Then He showed me it was so I would know it was a planet and not a star or meteor. Also, the other moon in Daniel Potvin's vision below appeared to be a catastrophe like this. In a dream I saw a beautiful, clear day. I saw people looking up at the sky, so I asked a gentleman next to me, "Why are you looking at the sun?" He replied, "That's not the sun". He looked over to the left and said, "That's the sun! " As we were all looking and observing this phenomenon, it started to get bigger. And soon it was raining fire and brimstone. People were in a state of panic, running everywhere, looking for cover. Immediately, I called out to the Lord, "What do I do?" Then a person dressed in a white robe appeared to my left. He said, "Take my hand; I'll take you to safety". He guided me to the steps of a beautiful palace. It seemed white in color. I found it strange that others did not see it and run to it for cover. As we were going up the steps, we were stopped by a guard. The guard said, speaking of me, "He can't come in; he is not paid for". Then the being with the white robe took something of great value out of his pocket and gave it to the guard. He said, "It has been taken care of". After this I found myself standing on the Earth and I saw people looking at the land. There seemed to be water covering the land and then the people looked up at the sky again. I saw something that was next to the moon that looked similar to the moon. I immediately replied to the woman in front of me, "I told you about the judgments, but you just wouldn't listen. You just wouldn't listen! Now it is too late". And when I looked up at the sky again, the clouds were turning back, like the Earth had been shifted. In a dream I saw a bright, sunny day and everybody was going about their business. Then suddenly, boulder-size rocks/meteorites started falling from the sky. People were in terror and running for cover. I saw some people hide under cars and run inside buildings, but to no avail. I knew running would be futile. So I screamed out to the Lord, "What do I do?" I heard the voice of the Lord. He said, "Go into the middle of the meteor shower". I thought that was crazy. But I thought that I'd rather die obeying the Lord than disobey and run for cover. I was told by the Lord that The Angel of The Lord was there. I was spared and no harm came to me. A group of Christians and myself were at Launch center. There were black pods, with clear windows, ready for launching into space. Next we went past the planets in the solar system. We came upon a large planet-size object. As the pods were passing the planet (object), all the pods started to turn back towards Earth in a circular motion, but the gravitational pull of the planet pulled me back and the pod remained unaffected in its trajectory. This caused me great distress. So I called out to the Lord because I felt I was going to be pulled out of the craft. I instantly heard the voice of the Lord saying, "Peace. Be still. I have everything under control". Then the gravitational effect on me was nullified. As the pods traveled back to Earth, we noticed a climate change that was abnormal for that geographical area. Also, I noticed that I was a few years older. Before the dream was finished, I asked the Lord why I was affected and not the pod. The Lord revealed that man is made of the Earth, and this planet (object), when it comes, will affect the Earth like a magnet. A few days ago, my 21-year-old daughter called and shared the following dream with me. I feel led to share it with you, as my husband and I believe it relates to the days ahead. Just briefly, I would state that the Lord has given our daughter many meaningful and prophetic dreams since she was a child. In the dream, she said that she was talking to me by phone. She was telling me that all the news channels were reporting that an object was approaching Earth from space and that this object would cause the world to end the next day. She said people were terrified and totally "freaking out". I told her that the world would not end the next day because we were not through the tribulation period yet. End of dream. After she relayed the dream, I was able to tell her that, yes, there are things coming toward Earth from space, but we are not to be afraid. The Bible warns us of these things and with so many people afraid, it will be a great opportunity to share the real good news and many will be saved. Also read The Destroyer Is Coming.